Of Wiarton, peacefully surrounded by her loving family at Grey Bruce Health Services Wiarton on Monday, February 16, 2015. Caroline May McCoy (nee Ward) at the age of 64 years. Loving mother of Brenda Gibbons (partner Thom Mack), Tracy Gibbons, Kim Gibbons (husband Jay Kropf), Cindy Gibbons (husband Jody Williamson), Melissa Leitch (husband Bob Winters), and Sarah Gibbons (partner Mark Davies). Forever cherished by her 21grandchildren. Sister of Roger Ward (wife Delores), and Cathie Frauce (husband Brendon Keating); and sister-in-law of Cathy Ward. Sadly missed by her nieces and nephews, and her dearest friend Shirley Given. Predeceased by her brother Jim Ward. 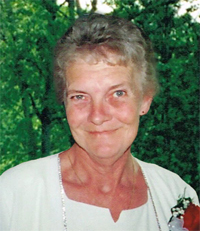 Visiting at the Thomas C. Whitcroft Peninsula Chapel, 272 Berford St. Wiarton (519) 534-5341 on Thursday February 19, 2015 from 7-9 PM, where a service to celebrate Caroline’s life will be conducted on Friday at 11 o’clock. Cremation to follow. Donations to the Canadian Cancer Society, or Salvation Army (Wiarton) would be appreciated.